Doing top of the year lists in television has become increasingly difficult in this age of peak television when there are around 500 scripted shows and it is impossible to watch everything new which is on. I’ve even heard some of the professional television critics admit to this problem and that their lists should realistically be called the Top X Shows Which I Have Watched. As each season adds to the number of shows which deserve to be ranked which I have not seen, I have annually limited my lists to the top new shows of the year. (The Top Twenty New Shows Of 2016 is posted here). In past years I have included all types of television, with a bias towards genre in the rankings. I found that this year I have seen most (but certainly not all) of the new genre shows which I believe are worth seeing, but when all types of shows are considered the percentage drops significantly. Therefore I decided to make the main list the Top Ten New Genre Shows Of 2017 and will mention some additional shows afterwards. One of three new X-Men or mutant related shows (with the X-Men and Inhumans possibly to be united if the Disney purchase of Fox goes through). This is definitely the more conventional of the two included on this list, and the mid-season finale opens hope that the show will be expanded from what we have seen so far. It is worth seeing with the combination of Root (Amy Acker) and Vampire Bill (Stephen Moyer), both obviously in new roles. 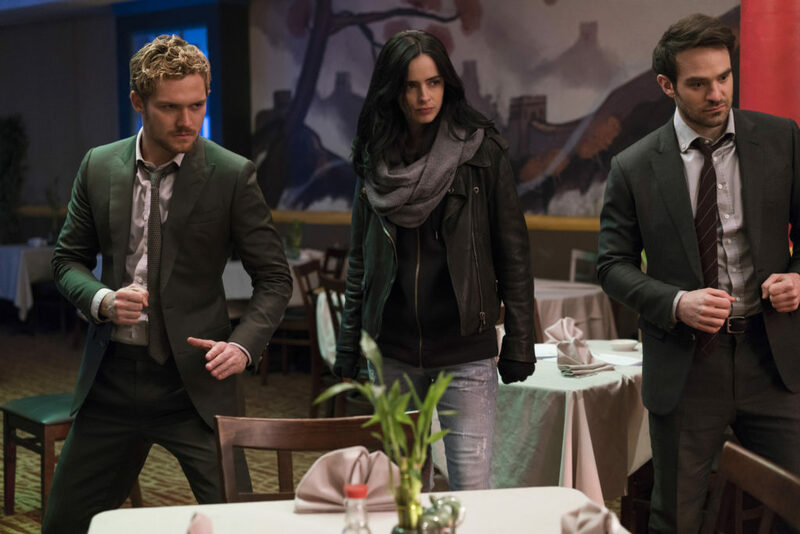 The team-up of Daredevil, Jessica Jones, Luke Cage, and Iron Fist was more worth watching to see the interactions of these four than for the battle against The Hand. I previously reviewed the series here. 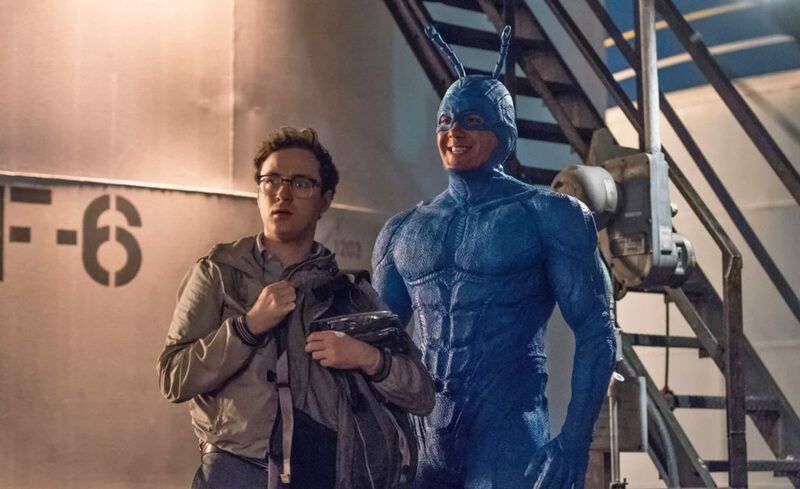 This was a far better than NBC’s attempt at superhero comedy with Powerless. More on the show here. Technically there are no superhero or science fiction elements in the show but I will include it as it overlaps with the Marvel universe, with Karen Page playing a significant role, and with the Punisher having been introduced in Daredevil. Like the other Marvel shows which are set up as one long story, it might have been better if cut to eight to ten episodes as opposed to thirteen, but they did do a good job of intermixing two related stories in the present along with flashbacks to set up the backstory. I did prefer the government conspiracy story line over The Hand as in the other two new Marvel series on Netflix this year. Yet another show based upon a Marvel comic, Runaways in tone is somewhere between the network-friendly Agents of SHIELD and the more adult shows on Netflix. So far it has done a good job of setting up a conflict between a group of teens and their villainous parents. Bryan Fuller and Michael Green have done an excellent job of adapting the first portion of Neil Gaiman’s novel, but it is now questionable as to whether this will survive with their departure from the show. There is a look at the season finale here. 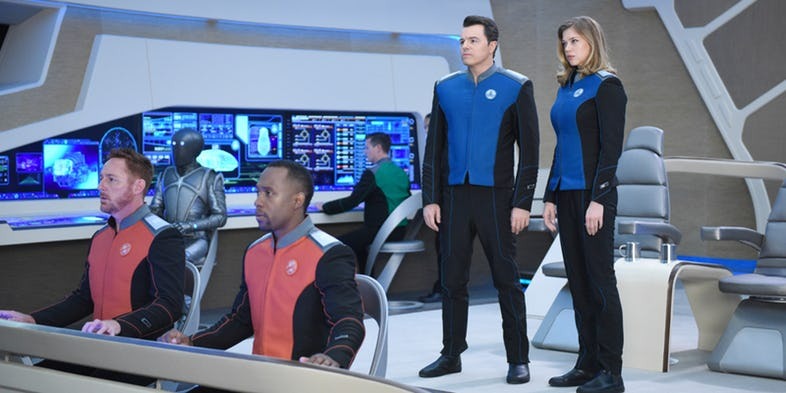 The show initially appeared questionable when billed as a parody, but over the course of the season Seth MacFarlane learned how to tell serious science fiction stories while mixing in humor. I had brief reviews of each episode, often looking at how well humor was incorporated into the episode, in each week’s post. My review of the season finale was here, with a follow-up look at the first season here. The show is strongly based upon Star Trek: The Next Generation, and many who prefer more conventional Star Trek, as well as episodic television, might prefer this over the other new Star Trek show. While many fans feel more comfortable with The Orville, Star Trek: Discovery is the more ambitious of the two. 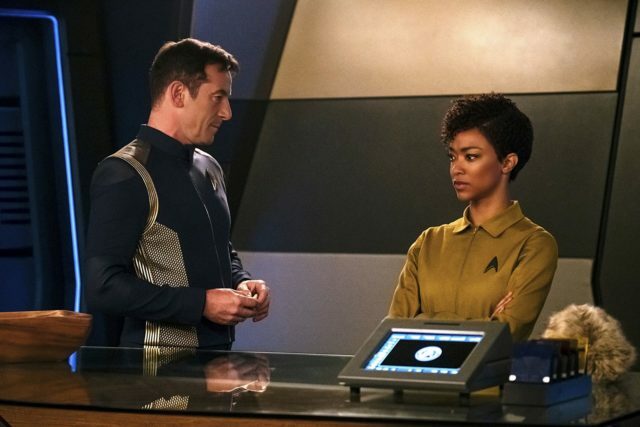 Discovery does a far better job than Enterprise did in making a Star Trek show with a more modern television feel, including a serialized format. This is also different from previous Star Trek series in taking place during a time of war, and having a Captain who is far more morally ambiguous. There are also questions regarding continuity which I discussed here. I had weekly reviews of each episode while the show was on, with the review of the fall finale here. Noah Hawley provided a quite original take on the X-Men universe, providing something new and unique to prevent superhero fatigue. My post on the season finale was here. 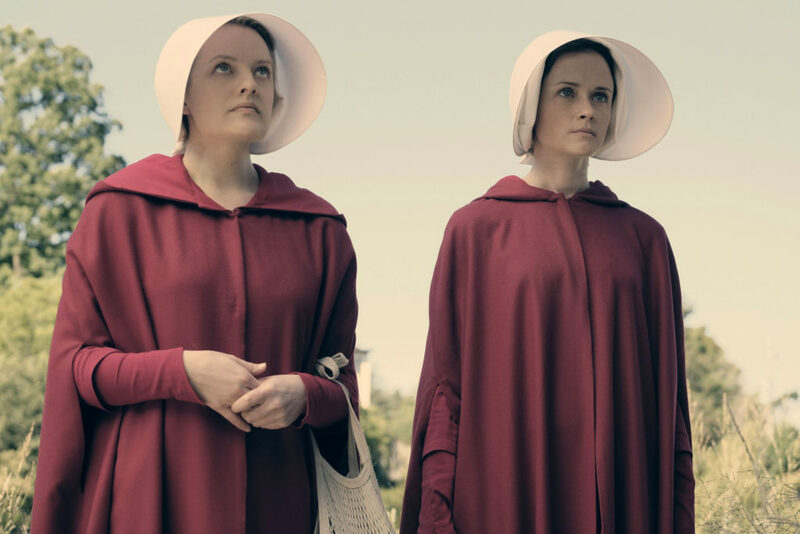 This excellent dramatization of Margaret Atwood’s novel about a dystopian future could have been a great series any year, but its treatment of women seemed so much more relevant at the start of the Trump administration–at time when its horrors seemed a bit more plausible. More on the series here. Among the shows which I saw but did not make the cut was Iron Fist, the weakest of the Netflix Marvel series. 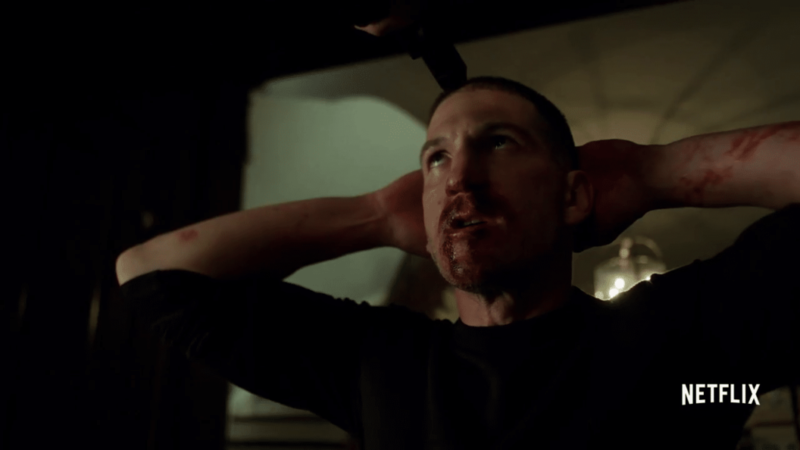 While flawed, it is watchable and does lead directly into The Defenders. If you still have a lot of Marvel shows to watch, put this off. If you plan to watch them all, it might make sense to still watch it before The Defenders. Two genre series which debuted in 2017 were remakes of past series. The X-Files (Fox) was generally disappointing, but with all the excellent episodes in the past I will still give the next season a try. I previously discussed the show here and here. 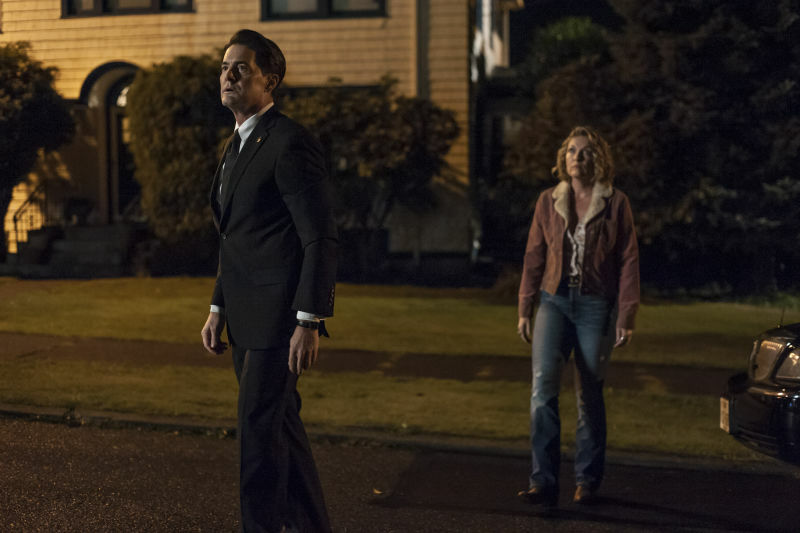 There was also the return of Twin Peaks (Showtime), which competed with Legion as strangest series of the year. I previously looked at the series here. There are also some genre shows which I have not seen but which might be worth checking out, such as the time travel comedy Future Man and the anthology series Dimension 404, both on Hulu. The genre show which I haven’t seen which is receiving the most favorable publicity is the German series Dark, available in the United States on Netflex. There were also a few genre flops in 2017. I gave up on Powerless (NBC) midway through the season. I didn’t watch The Inhumans (ABC) after numerous poor reviews. If interested, Io9 summarizes what happened on The Inhumans for those who stopped watching. Time After Time (ABC) was cancelled before I had a chance to give it a try. Moving beyond genre, there were also many excellent shows in 2017. There were two excellent dramas dominated by women, Big Little Lies (HBO) and Godless (Netflix), which I am currently in the midst of watching. The three top comedies from 2017 which I have watched also are led by women: The Marvelous Mrs. Maisel (Amazon Prime) from Amy-Sherman Palladino, GLOW (Netflix), staring Allison Brie, and SMILF (Showtime). While not genre, the CW also premiered another comic based series in 2017, Riverdale, which presents a new take on the Archie comics. What does Twice Upon A Time have in store for us? There are some new eerie creatures of glass haunting the Doctor and his friends throughout this story – but what their purpose and what their plan is, and what their time traveling machinations are, is going to be a big surprise to the Doctor. Were there any sets or locations that you particularly enjoyed working on? There’s a real range of spaces that we visit across the special. We have the inside of a giant stone spaceship full of creepy glass creatures. We’re in the first Doctor’s TARDIS – recreated and brought back from the 1960s to stand proud in the Welsh studios. We’re on a First World War battlefield. And at long last we go to a location that I mentioned in my very first episode of Doctor Who back in 2005, as we visit the ruins of Villengard. How would you describe the tone of this episode? This episode is somewhere between a coda and drumroll. It’s a coda to the time of the Twelfth Doctor played by Peter Capaldi, and a drumroll to usher in the Thirteenth Doctor, played by Jodie Whittaker. Approaching it, one issue I had was that The Doctor Falls (this year’s series finale) was the end of Peter Capaldi’s Doctor. That episode saw the Twelfth Doctor stating what he stands for and standing on the hill on which he was prepared to die. That was the end of his story. But – as often happens in stories and real life – it didn’t end there. He kept going, he started to regenerate, so at Christmas what we’re going to see is a man weary and tired and, having made his point and having made his stand and given his life for something that matters, he has to learn just how to carry on after that. But of course this being Doctor Who and Christmas it’s much warmer and hopeful than that, so in perfect timing walking towards him out of the snow he meets earliest incarnation. The William Hartnell version of the Doctor – played now by David Bradley in an astonishing performance – and the two of them are about to regenerate. Tonally it’s about saying “to hell with dying, let’s get on with living”. And what’s more Christmassy that that? It’s the turn of the year, a time for new beginnings, it’s the time when we start climbing back towards the light. How does the First Doctor look at the Twelfth Doctor? Well the Doctor never gets on with himself. Arguably he doesn’t get on with himself when it’s just him alone – we had the whole plot of Heaven Sent (in series nine) about that – so he doesn’t get on with himself even when it’s just him. But here I think we have perhaps one of the most interesting instances of the Doctors meeting, because the First Doctor as we know from the show is quite different from the Doctor we know now. Without noticing it, or it ever being his plan or his intent, he’s starting to engage with the universe and he’d be horrified to think that he’s starting to become its protector. Now, at the end of that lifetime when the First Doctor is facing his end, he doesn’t yet realise that’s what he already is. He’s already the man who rides to the rescue, the saviour of the oppressed, but he doesn’t own up to that. Now he meets the Twelfth doctor, and the Twelfth doctor has been doing this for so long. He’s used to the idea that he’s already Earth’s protector – an idea that completely bewilders his younger – except kind of older self. The thing to focus on this time, alongside the flourishes that distinguish the two doctors – it that they are at very different moments in their lives. The First Doctor is not quite yet the hero we are used to. 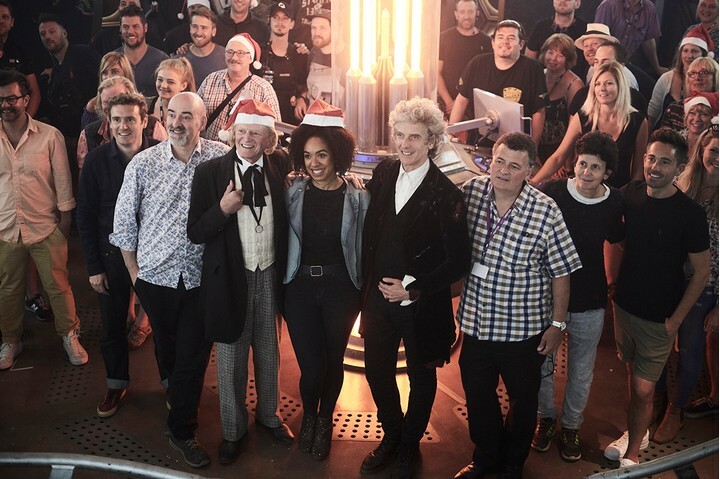 How did you feel to be writing your final episode of Doctor Who? The truth about writing anything is that it’s always difficult. You can change the reason why it’s difficult, but the fact is it’s just always difficult! Throughout writing this I wanted to feel more about the fact it’s the last one I’ll ever write, and I wanted to feel more about it’s the last one Peter will ever play, but the truth is that the technicality and the difficulty and the demands on your creativity – all that overwhelms you to the point where you’re just trying to write a great Doctor Who story! That’s enough to contend with – you can’t have the real life drama of two old Scotsmen making their way to the door. Once we got into shooting it, however, and especially when we approached filming Peter’s last moments as the Doctor which were done at the end of the shoot, we did talk more about how exactly he should meet his end. We were both very pleased with that final section of the script already, but as we went through piece by piece we thought there were ways to improve it so I’d be banging out new pages each night for us to discuss on set each day. That was so enjoyable and exciting to do – to really feel that we were getting his send off right – that in a way it took whatever emotions we were both having about leaving and put them on screen where they belong. By the time we got to that part of filming I think Peter and I were probably the least emotional on set because we’d put it all in the show! David Bradley previously told Digital Spy that he had high hopes for his former Broadchurchco-star Jodie’s tenure as the denizen of the TARDIS. “I was delighted [by the casting],” Bradley told us. “I was wondering if [showrunner] Chris [Chibnall] would pick someone from the Broadchurch cast. The TARDIS Yule Log video has some glimpses of Twice About A Time. What were the characteristics about Bill that jumped out at you right away? Well, she’s quite cheeky, which I liked. But she’s also intelligent and doesn’t feel the need to brag about it. It’s very much a part of her, and she’s not ashamed to just say things. She has this confidence that I really engaged with; she doesn’t let her life or experiences get the better of her. She also wants to learn more and is very inquisitive. We see that in the way she challenges the Doctor from their first meeting. That’s a different dynamic from past companions. Yeah, and that’s the energy that I felt when I first read the script. There’s an irreverence between her and the Doctor, even though there’s also a lot of respect and they grow to be very close by the end of the series. She’d never be like, “I bow to your superior knowledge.” It’s more akin to, “Well, actually I don’t agree with that. What about this?” I think he respects her for that; they both enjoyed the verbal sparring they had. It’s enjoyable to watch that dynamic. How quickly did you establish that rhythm with Peter Capaldi? I met him for the first time in my second audition — my callback essentially. Before that, I’d been reading the script on my laptop with the Facetime camera on, responding to a recording I’d made of myself doing a version of Peter Capaldi reading his lines! The real Peter is a much better actor than that — much more dynamic. [Laughing] When I went into the room, I was absolutely terrified because Peter is not only an incredible actor, but he’s also been playing this character for a long time. We read the first scene of Episode 1, this mammoth six-page scene, and I spent most of it standing there just hoping that what I was doing was right or at least interesting. Then we did the scene where Bill goes into the TARDIS for the first time, and Peter said, “Do you want to stand up?” I went, “What? OK, sure.” In auditions, you’re supposed to sit still and keep your face as still as possible, but if you’re me, your face tends to move of its own accord. Steven enjoyed that and used it a little bit in the first episode when Bill is standing at the window in the Doctor’s office and says, “I see my face all the time. I never liked it; it’s all over the place — it’s always doing expressions when I’m trying to be enigmatic.” But, yeah, I mainly remember standing there aghast at being in a room acting with Peter Capaldi. Luckily, Bill was supposed to be pretty aghast when she walked in the TARDIS, otherwise we may not be having this conversation today! I think we were both responding to each other quite honestly and seemed to work in a very harmonious fashion. BBC America posted this thank-you video for Peter Capaldi. To date, that’s one of the best answers someone connected with Doctor Who has given to the question. It’s far better than Matt Smith’s answer from long ago that it was “Drasicanawhocius” or some long name similar that is easily abbreviated by saying “Doctor Who.” It’s also more interesting than the some diehard fans’ explanations that the Doctor’s name is actually a rather hard-to-pronounce set of Latin letters to varying powers. Given that, Peter Capaldi’s response to Radio 2’s Access All Areas (via Digital Spy) should win as it gels with the awesomeness of the Doctor and doesn’t risk the spraining of the tongue muscle trying to pronounce. We can get into a fight about whether he’s called The Doctor, or Doctor Who. The reason I call him Doctor Who is because when you’re in the street, people don’t shout out, ‘There’s The Doctor!’ They go, ‘Hey, Doctor Who!’ That’s his street name. His street name is Doctor Who. Announcements came out last week regarding the fates of network shows. With most of the shows worth watching now being on cable and streaming, this news is not as major as it once was, but there is still some news which impact genre shows. A list of renewals and cancellations from all the networks can be seen here. 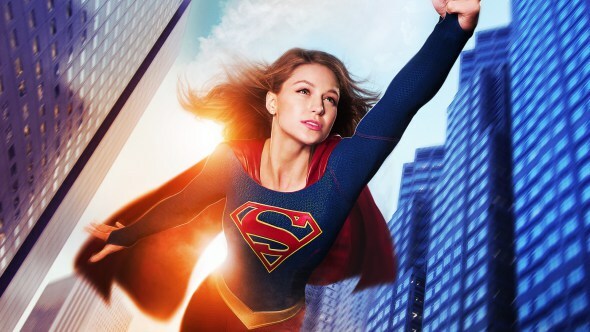 As discussed last week, CBS did go ahead and cancel Supergirl, but it will be continuing on the CW Network (which CBS partially owns). This does seem where it belongs anyways. CW will most likely wind up paying less for the show than what studios charge CBS. It will also save money in moving production to Vancouver. Besides the lower costs involved in filming there, they can probably save additional money by sharing costs with the other Berlantiverse shows. The move to Vancouver might also affect the cast if not everyone agrees to go. Most likely they did make it worthwhile for Calista Flockhart to come to Vancouver periodically. With the vast majority of her scenes occurring in her office, it might be possible to have her come out to film for a few episodes at a time, and then return home. This would also make it easier to have more cross over episodes with the other Berlantiverse series, with the casts of all four shows working in Vancouver. Supergirl takes place on a different earth, but we have already seen The Flash make it to her earth, Supergirl should be able to replicate what Barry Allen did to cross over, and the Waverider on Legends of Tomorrow can travel between the multiple earths. In other genre series on CBS, we’ve already knew that Person of Interest has been canceled, and Limitless remains on the bubble. The network has given a series order to Powerless, which stars Vanessa Hudgens (Grease Live) as a “spunky young insurance adjuster specializing in regular-people coverage against damage caused by the crime-fighting superheroes.” (Think The Office meets Agents of S.H.I.E.L.D. minus Marvel). Marvel series have not done as well as DC on network television. While Agents of SHIELD returns on ABC, ABC has both canceled Agent Carter and decided not to pick up Marvel’s Most Wanted. The good news is that, along with cancellations of Nashville and Castle, Adrianne Palicki, Connie Britton, and Nathan Fillion are all available for new shows. ABC did pick up Conviction staring Haley Atwell. Maybe Netflix, which has been the strongest television outlet for Marvel, will also bring back Agent Carter when Atwell’s schedule permits. Before Agent Carter was canceled, there was talk of still continuing the show and work around Atwell’s schedule. A grittier version should do well on Netflix. Fox, where many other genre shows have died too early, didn’t have the sense that ABC did in ending Castle when with the loss of a star. For reasons nobody understands, they have renewed Sleepy Hollow. In good news from the network, Fox is also renewing Gotham. Lucy is one of the most history popular professors at her university when TIMELESS begins, but her modern teaching styles don’t really appeal to the school’s tenure committee. And while she seems very unappreciated in the world of academia, Lucy is about to get a big opportunity that perfectly fits her skills. One night, a mysterious criminal and his henchmen steal a secret state-of-the-art time machine and they’re looking to destroy the country as people know it by changing the past. Lucy is soon recruited by Homeland Security — along with soldier Wyatt and scientist Rufus — to help retrieve the machine and stop the criminal from changing the past. To do that, they’re going to use the machine’s original prototype. Their first stop is to 1937 and the site of the Hindenburg disaster. But in addition to preventing the past from being destroyed by this criminal, they also have to make every effort not to affect the past themselves. In the new venture, undercover operative Tom Keen teams up with Susan “Scottie” Hargrave (played by Famke Janssen), “the brilliant and cunning chief of Grey Matters, a covert mercenary organization that solves problems governments don’t dare touch,” per the series’ official description. 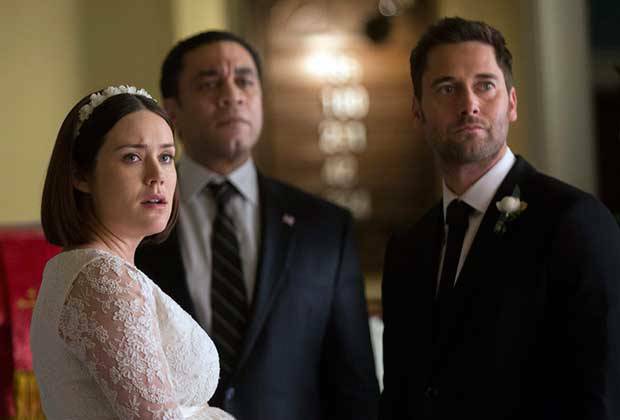 This suggests that if Lizzie returns from the dead on The Blacklist after Megan Boone’s maternity leave is completed, she will probably not be with Tom. Other networks are joining NBC in premiering time travel series next season, including ABC with Time After Time. This is based upon the 1979 movie about H.G. Wells chasing Jack the Ripper through time. Teaser above. Fox will have a time travel comedy, Making History. A list of the new network shows can be seen here. John Barrowman made a statement on Facebook which has attracted a lot of attention: “I will be back in Cardiff in about a week and a half. But I’m not telling you what for…sssh!” This has led to speculation that he is returning to Doctor Who, possibly for the Christmas episode. The spin-off Class also films in Cardiff. 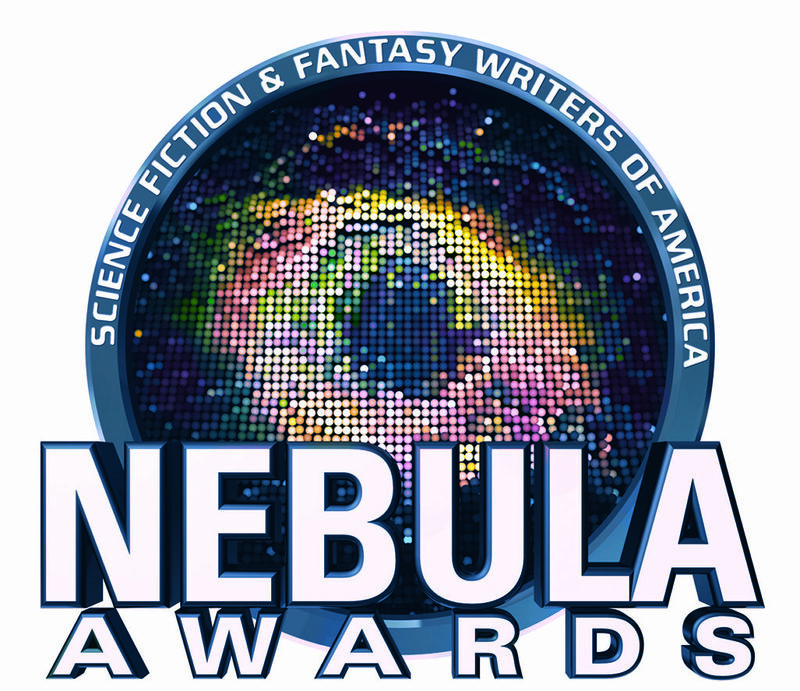 The Nebula Awards have been announced. Uprooted by Naomi Novik has won as best novel. The winner of the Ray Bradbury Award for Outstanding Dramatic Presentation Winner was Mad Max: Fury Road.